One of my early literary discoveries was Richard Brautigan. In my teens I was put off by written language that seemed too remote. Bertolt Brecht was one of my early favourites. He still influences my politics and thinking. Richard Brautigan wrote poems that seemed so ordinary. They sounded like thoughts pulled from the air and put on paper. Some were so close to thought that had crossed my mind that I started taking my own random thoughts more seriously. Some of the following Brautigan prose poems give you an idea what I am talking about. On most days, Brautigan doesn't make it on to my list of literary giants. Despite this, he taught me to look for beauty in the commonplace. He taught me to look close at hand for artistic beauty. 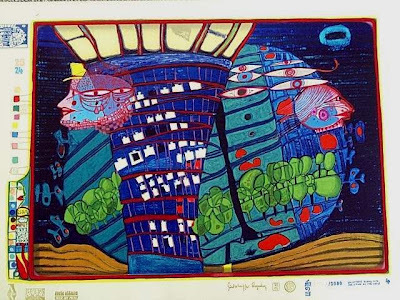 A painter named Friedensreich Hundertwasser coined an aphorism to describe what Brautigan accomplished for me with his writing when he said "The lines I trace with my feet walking to the museum are more important than the lines I find hung up there on the walls. Another sixties figure named Malcolm Boyd wrote a best seller. "Are You Running With Me Jesus?" It was billed as a book of prayers. At the time I was struck by its informality. It reminded me of hurried conversations crammed into a short lunch break with a friend. It bore little similarity to the prayers I had learned about in Catholic school. As a twelve year old the book seemed vaguely cool. I couldn't put my finger on its relevance to my life. Years later, when I was converting to Judaism, I met followers of Rabbi Nachman of Breslov, and it became clear that the idea of informal prayer, of speaking to G-d in a conversational tone had been around a very long time, centuries before Malcolm Boyd. In Breslov chassidic teaching it is referred to as hisbodedus. It was a powerful discovery. Here in New York and also in the Holy Land, there are Breslovers who hand out pamphlets about that and other topics in Breslover chassidus. I mostly follow the customs of Lubavitch, but I have found that Rabbi Nachman's articulation of hisbodedus has been a powerful influence on me. When I am totally broken and exhausted, it remains within reach. Eventually, pieces of formal scripture and prayer resonate as though they were my own words. The following Psalm, Psalm 121 reminds me of a very troubled time in my life. My son called me from the Western Wall. He put his cell phone on speaker. I faced east and recited from psalms that are said in time of crisis. I felt as though I were there. When I finally visited there about a year later, I felt as though I were returning. The following is the English translation of Psalm 121. 1.A song for ascents. I shall raise my eyes to the mountains, from where will my help come? א. 2. My help is from the Lord, the Maker of heaven and earth. ב. 3. He will not allow your foot to falter; Your Guardian will not slumber. ג. 4. Behold the Guardian of Israel will neither slumber nor sleep. ד. 5. The Lord is your Guardian; the Lord is your shadow; [He is] by your right hand. ה. 6. By day, the sun will not smite you, nor will the moon at night. ו. 7. The Lord will guard you from all evil; He will guard your soul. ז. 8. The Lord will guard your going out and your coming in from now and to eternity. There are people who remind you that beauty and prayer are not distant and remote, that they are not locked in a hose of worship or a museum. Richard Brautigan, Malcolm Boyd and Friedenreich Hundertwasser paved the way for me to be receptive to the words of Rabbi Nachman in the proper time. I am grateful to them all. France Extraditing Rwanda "Butcher of Tumba"
Haiti's Restaveks, What is their Future? Bamboo Bicycles, Bamboo Beer !